Lab 4 is due on Monday, July 22, 2013, at 7:00am ET. 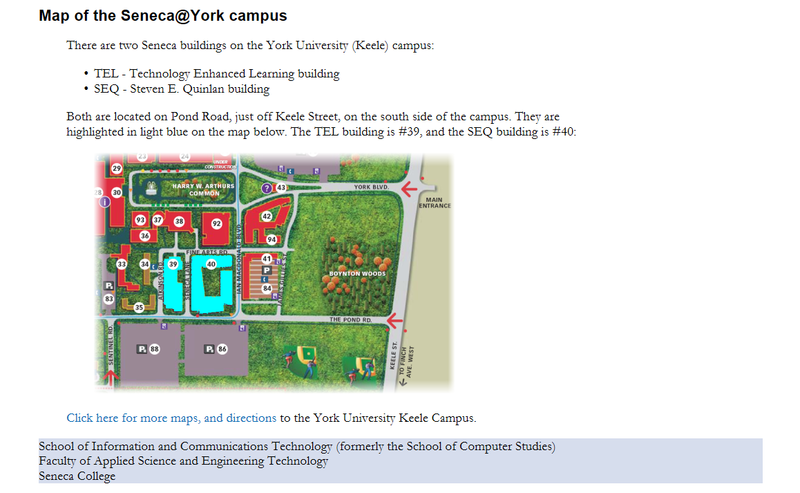 For this Lab 4, you have the opportunity to demonstrate the correct use of CSS for simple tasks. Download the ‘sample-july18.zip’ compressed/zipped package, and save its contents in a folder named ‘lab4’. In a source code text file named ‘styles.css’ (saved in the lab4/ui/css sub-folder), you will create CSS rules that will affect the formatting and appearance of the ‘original.html’ document. When appropriate and necessary, you will also edit ‘original.html’ to enable your CSS rules to work the way you intend. DO NOT use a programmer’s source code editor. Use only a plain text editor that does NOT perform source code formatting and completion tasks. Improve the formatting and appearance of ‘original.html’, by adding CSS rules (and editing ‘original.html’ when necessary). Your goal is to change it to be professional-looking, well-formatted, well-organized, readable, appealing, and attractive. We expect that you will likely have to create between 20 and 50 rules to get the job done. 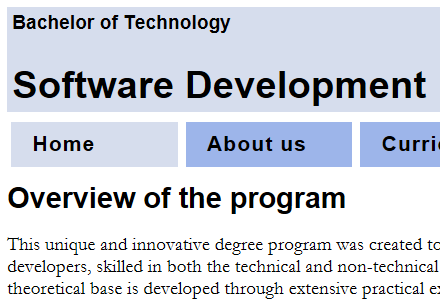 Your professor acknowledges that you likely do not have formal training and knowledge of user interface design. However, you have used the web for years, so you are definitely qualified to have an opinion. We suggest that you think about – and then visit – five to ten of your favourite web sites (or web apps). Then, document – write down – the user interface and user experience features that are meaningful to you. The features are wide-ranging, and could include content, colour, type, layout, organization, interactivity, ease-of-use, and so on. In a section below, you will learn more about layouts. As noted above, there will be a horizontal navigation menu strip. The menu choices are currently in an unordered list near the top of the HTML document. In a section below, you will learn more about menus. By default, an HTML page is rendered relative to the upper-left corner of a browser tab/window. Each element is rendered in the sequence that it appears in the HTML source code document. 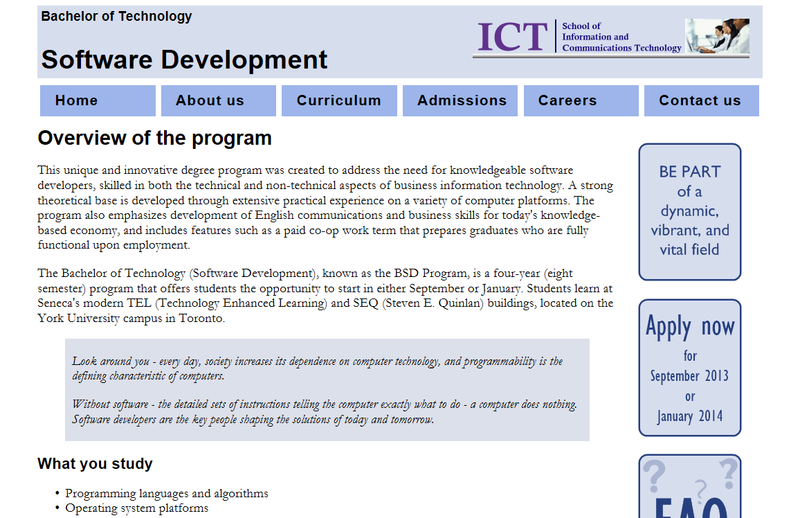 Therefore, if the HTML document includes two div elements in sequence, their content will be rendered in sequence. The first div element’s contents will appear, followed by the second div element’s contents, below the first div element. We will change that behaviour using CSS rules. Our goal is to place the content of two elements side-by-side. Also, by default, some elements have a width of 100% of their parent’s width. Others are only as wide as their content. We use HTML elements and CSS rules to change these defaults. 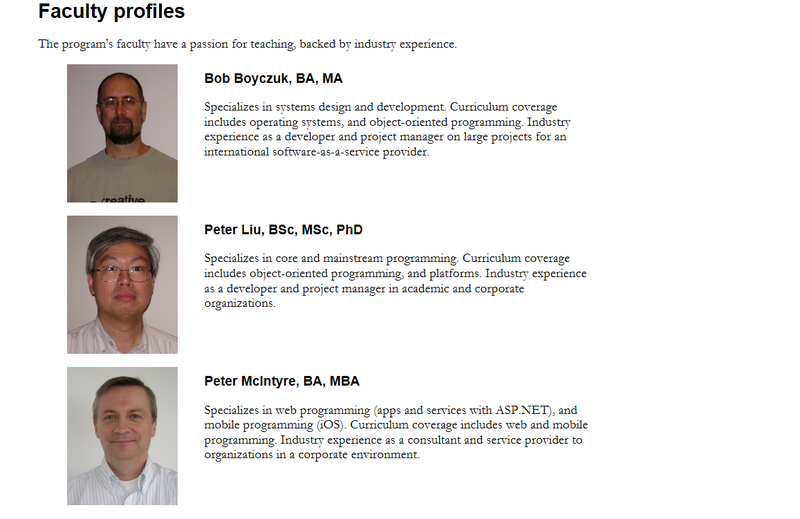 You will notice that it includes a header, and a horizontal menu strip in a nav element. Also, a footer at the bottom. 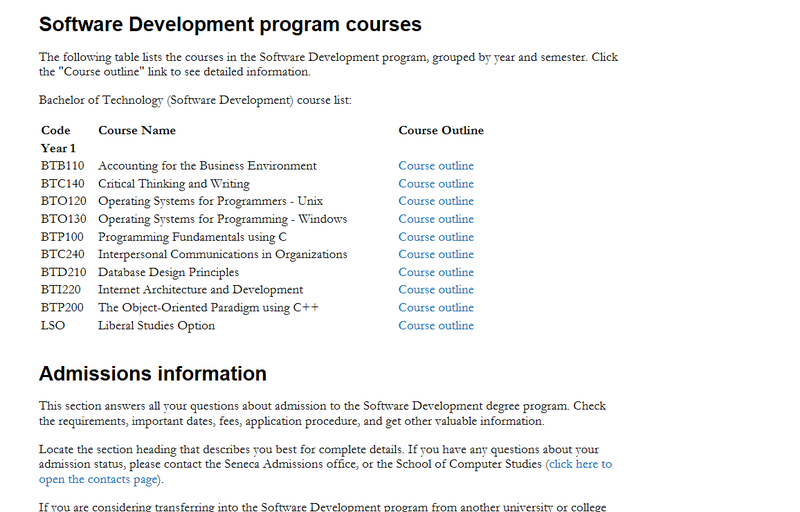 The content area is organized in two side-by-side “columns”. 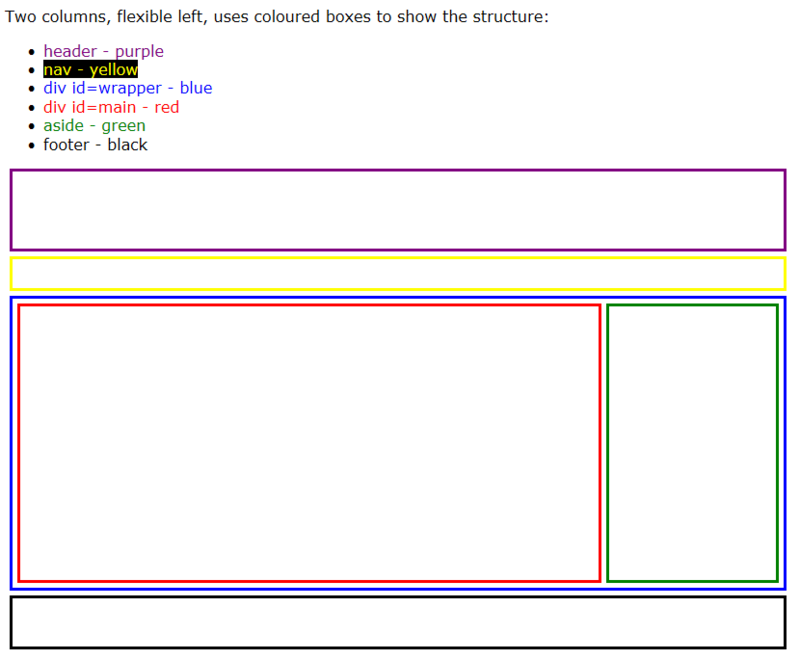 The left “column”, which uses most of the width, has the page’s ‘main’ content. The right-side “column” includes some images (but it could hold anything, text, images, etc.). Here’s how to make this happen. You must edit the ‘original.html’ document, and add more rules to your ‘styles.css’ document. Therefore, you must edit ‘original.html’ to match. Now, consider the web page’s content. Should it have a maximum width? A minimum? Probably, to both. Those rules should have a body selector, and the measurement units should be px (pixels). Experiment yourself, but somewhere in the range of 800px to 1200px. The ‘footer’ needs a rule to ensure that it is positioned at the bottom of the page’s content: ‘clear: both;’. The ‘div id=main’ element contains the web page’s main content. We want it on the left. Using CSS terminology, we want it to ‘float left’. We also want it to have a flexible width. You simply have to do some basic arithmetic (and use paper-and-pencil) to lay out the content, using the dimensions of your content. With the ‘float: left;’ rule, the element will be positioned to the left of the elements that follow it. Later in the course, you will learn how to create more layouts for different configurations. In this section, other formatting and appearance issues are discussed. Also, the element surrounding the professor’s name was changed to h4 (it was a p before). To fix that, the ‘.profile’ rule simply needs another definition to ‘clear: both;’. You must think about the width of an HTML table. It can be just wide enough to hold the data, but then the content is too close. You need some whitespace. It can also be the full width of the parent’s container, but that may cause too much whitespace. Ideally, it should be somewhere in between. You can choose a fixed width (if you can’t tolerate your table’s data being wrapped in a table cell), or a percentage width. For many tables, a width somewhere between 50% and 90% often looks fine. By default, an image that’s inside an a (hyperlink) element has a border around it. You will have to add a rule to remove the border. Use a specific selector (e.g. ‘a img’), so you don’t accidentally affect other images. The OCAS image – and its container ‘a’ element – should also be on the right. Study ‘original.html’. 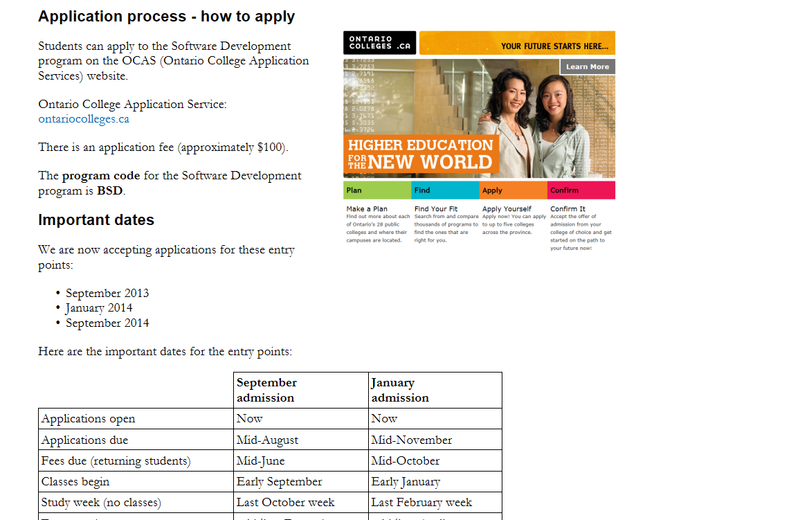 It appears just above the paragraph elements under the “Application process…” heading. Edit the HTML document to target the ‘a’ element correctly. You can do it with a unique identifier (e.g. ‘id’), or with a group (e.g. ‘class’) if you think that you may use the same strategy for other images on this or other pages. Then, add a rule that will ‘float: right;’ (which means that the element will be positioned to the right of the elements which follow it). Save your “lab4″ folder in one single zip/compressed file (.zip or .7z).